Mark Keating and Olivia McCaw took the top prize of “Best Student” at recent baking competition with their Candyland-themed cake. 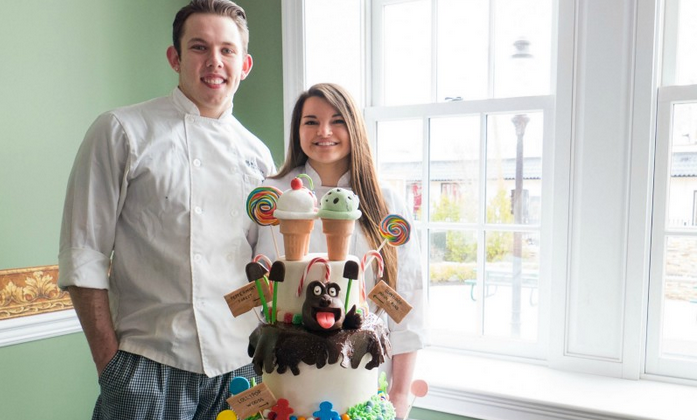 As the first Rowan College at Burlington County students to ever enter the “Let Them Eat Cake” competition, held in Philadelphia in March, Olivia McCaw, 20, and Mark Keating, 23, set the bar high by taking home the top student prize. Keating, a Cherry Hill resident, fell in love with baking at a young age. Keating and McCaw competed against more than two dozen bakers, comprised of students and professionals, coming in first with the “Best Student” award. The award, Keating said, accounted for the cake as a whole, including the appearance, flavor and concept. The theme given to the contestants was “childhood fun and fantasy,” which the students met with a Candy Land design. McCaw said her grandmother inspired her to take on baking as more than just a hobby. Before college, McCaw would bake birthday cakes for friends and family, but nothing like what she is capable of now, she said. The pastry arts students said they were hesitant at first to participate in the competition when their chef recommended they sign up. However, they showed up with the mindset of having fun, rather than winning, and credit this to their success. The Candy Land-themed cake was a play on Tiramisu, Keating said, with a vanilla bean cake soaked in coffee and rum with a cream cheese mousse and Swiss buttercream frosting. The students were shocked, they said, when the judges called their table for the award. Both McCaw and Keating are planning to stay local after college, at least for a little while. McCaw works at ShopRite as a cake decorator, something she hopes she can continue after she graduates this spring as she looks to start a career. She said a dream would be to open her own bakery. Keating works as the cake decorator for Sunflour Bakeshop in Mt. Laurel, as well as LuluLemon. He said he’d like to make the move to Philadelphia in the future, but right now he is happy with where he is and what he is doing.